It somehow seems fitting that I’d make a big change in my own living arrangements less than a year after Living Arrangements was published. Peter and I have become first-time homeowners, a move that probably surprised us more than anyone else. We were very happy apartment dwellers, and while I have a few reservations surrounding home ownership, this somehow felt right. I tend to over analyze and agonize over major decisions, so when something does “just feel right,” I try to go with the flow. But, of course, buying and moving into a new home takes a tremendous amount of time and energy. I got my first taste of what the coming months would be like the day after we closed and I decided we simply must pull up all the first-floor carpeting to reveal the hardwood floors. Cut to us spending hours and hours scrubbing the 85-year-old floors while making multiple trips per day to Home Depot and trying to figure out what the heck we are doing. All this hard work will be worth it, and I don’t just mean our gleaming living room floor (all thanks to Peter) because, you guys, this house means I get to have my own writing room. Sure, right now it’s a home base for the cats so they can settle in, but soon it will be all mine. The only time in my life I’ve had a dedicated writing room was when I had a fellowship room in the campus lit house my senior year in college. I almost can’t imagine what it will be to have my own quiet room that I can arrange just as I like and have the physical and mental space to write. And for the times I need to get away in order to get some work done, there’s a cafe just down the street. I’ll post photos of my writing room (and the house in general) in the coming weeks/months, depending on how long it takes to pull everything together. I might be light on blog posts for the next week as I continue to unpack and work on house stuff, but rest assured that I’ll continue visiting your blogs in the meantime. I’m still here — I’m just drowning in unpacked boxes, cleaning supplies, and tubs of shellac. But I think that’s a good thing. After all, I’m home. How exciting! A writing room! That will be amazing. 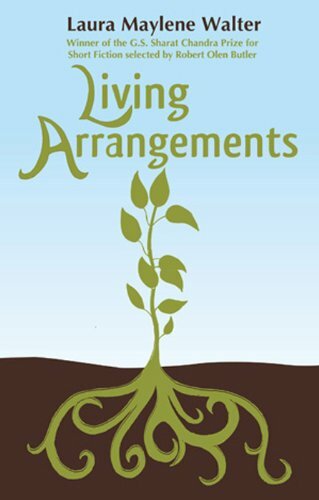 I’m looking forward to seeing how you arrange it. Thanks! I’m excited, even though I know it will probably take a long time to create my ideal writing room. For the coming months, a quiet room with a desk and a bookcase will be amazing all on its own. Such happy news!! I can’t wait to see the pictures. I hope you get before and afters of the floor, the writing room, all of it. Congratulations!! A new house, very exciting. our first house included my husband and dad refinishing all the hardwood flooring (except the kitchen and bath which were both old school cafeteria tiles). It took two weeks b/c they are both perfectionist with such tasks and kept trying to sand out the imperfections with one of those big industrial sanders they rented from Home Depot. i remember just wanting to move in and kept telling my husband, “they’re fine.” i was so annoyed with the entire process. we bought that house in our second year of marriage. now, almost fourteen years later, i am so very, very happy to have a husband who is so focused on details. in the beginning it annoyed me. now i appreciate how much more beautiful he has made the places where we have lived. The floor situation started out all thanks to me and my impulsive decision to start cutting up the carpet. Peter probably would have been happy to live with the carpet, but I was dying to know what the floor looked like under there. We’re really happy we’ll end up with the original hardwood floors — even if I did pull up all the carpet and then dash off on a business trip, leaving Peter behind to finish much of what I started! Oh, so smart of you to do the floors before you move in!!! Yes, congratulations! What a beautiful way to start your summer. Yay! Congratulations!!! This is big, exciting news and I’m so happy for you both. And your own writing room. 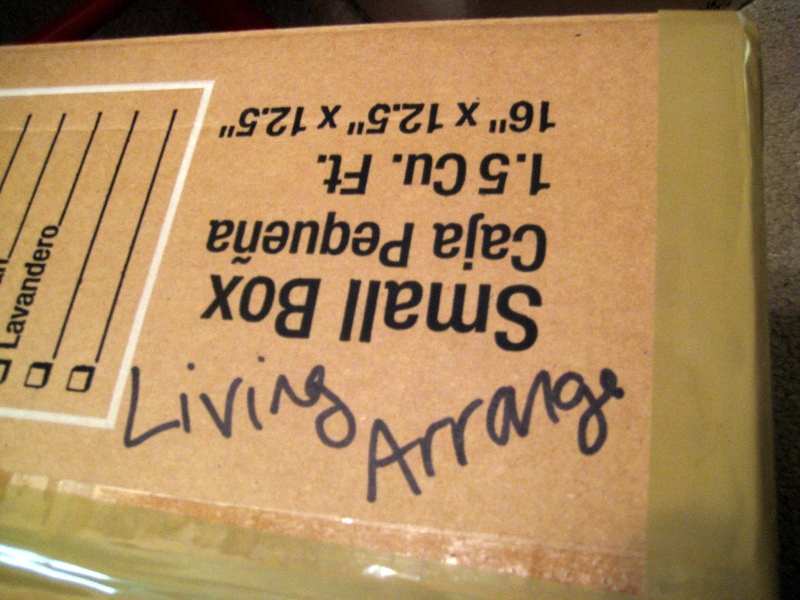 You must be living right. This is so exciting, Laura! I had my own writing room in our old house. It was small, but lovely. And hardwood, too? Nice. More excitement—Memory Wall was waiting for me when I came home! Thanks again for drawing my name! Your first house! I’m thrilled for you. And how exciting to have a writing room, for the cats. (ha) No, really, you know your cats think the room is theirs! As someone else already said above, I’m looking forward to photos. And I’m hoping I can make it to your show in Sacramento at the end of the month. I get home from my workshop on the 24th and then we have a houseguest. But I’m thinking she’ll be busy and we’ll be able to escape for a night away. (it’s a 3 hr drive so we’d just spend the night) I’ll let you know when I get home. Here’s to your new home, Laura! Wow! I miss some posts and pow! The big news. Congratulations and happy home making to all of you. I can’t wait to see the photos. And your own room? Eeeeee! It truly is a dream home. Looking forward to the photos. Having a home for me meant I was really grown up. It was far from where I expected to land, but now everything pivots around here. Good luck with the floors and good on you for finding a writing room! Congratulations you home owner, you! 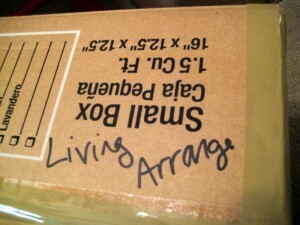 I love that you wrote Living Arrangements on the box.